Will you look like a mad scientist when brewing your coffee with this Pour-over Stand? I certainly hope so, as the process is completely on show, and there will be plenty of opportunities to wiggle your eyebrows and laugh maniacally when the coffee is ready for serving. 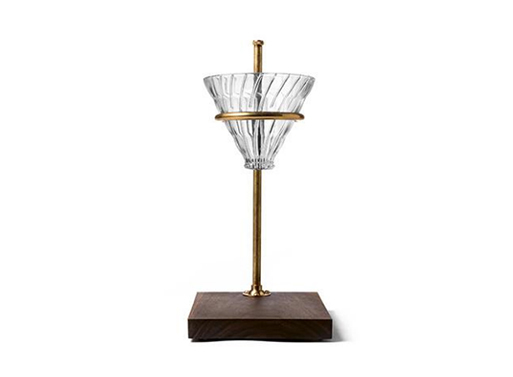 The lab style brass stand holds a Hario V60 glass pour over (included) that adjusts for mugs or decanters. An American walnut base contrasts nicely. This item is no longer available from the original retailer. The link goes to a similar version. Available from Food 52, $179.00.